During my inagural summer sail on Long Island Sound last weekend the topic of favorite LIS destination anchorages came up. Shelter Island is always top of the list in conversations with Sound sailors...I'm relatively new to the scene and aside from crewing a few Stamford/Vineyard offshore races and doing the NOODS out of Larchmont in 2005, my LIS cruising experience is limited to the types of excursions I took this past Saturday - four or five hour jaunts under sunny skies, no anchoring required. But I've long been interested in the Thimble Islands which are - as wikipedia will tell you - an archipelago of small islands in Long Island Sound, in and near the harbor of Stony Creek, Connecticut in the southeast corner of Branford, Connecticut, 41°15′52″N, 72°45′11″W. For some reason I've had many a LIS weekend warrior either profess to have never hear of the Thimbles (I'm sure a welcome trend if you enjoy them) or otherwise flat out slander the destination. Regardless, I know they offer sheltered deep water anchorage and their history is fascinating. What am I missing? It happened. I've emerged from the desert and slaked my thirst. I've come down from the mountain. I've risen through the ashes and been reborn. Hyberbole yes, but it's the way it felt when I actually got out on the water this past Saturday. Though drifting on Long Island Sound (see above red nun 32 off Stamford, CT) in barely ten knots of light and fluky wind is nothing to crow about...but for a guy with two young children, a beleaguered stay-at-home wife and a corporate job, well, it was bliss. Through the long northeast winter it's easy to forget how the smell of the water and the sounds of winches clicking, sails snapping, the water rushing by the lee rail - transports me to that place where the day-to-day hassles drop away, the mind clears and time slows before gathering itself in a rush of wind, water and sunshine. The summer begins. Lyrics to a "Heart" song came in from Fred @ Wingsail the other day. I was never a big "Heart" fan but these words are great. Thanks Fred...Happy Memorial Day all. The crew of ABN AMRO TWO are making public statements about the tragedy. If you haven't caught up on it there's a good recap in Sailing World. I'm doing research on nautical verse/quotes to post in the margin of my new template and I came across a once iconic sea gypsy - Bernard Moitessier - a brand new additon to my nautical Pantheon. Bernard, as you can read here, single-handedly circumnavigated around the world in a 39 foot steel ketch to finish first and fastest in the 1969 Sunday Times Golden Globe Race. Not only have I had the pleasure of learning about this prolific writer and stalwart sailor - but as well I've increased my knowledge (and thus yours) on the origin of offshore racing. The Sunday Times Golden Globe Race was a non-stop, single-handed, round-the-world yacht race, held in 1968–1969. It was the first round-the-world yacht race in any format. 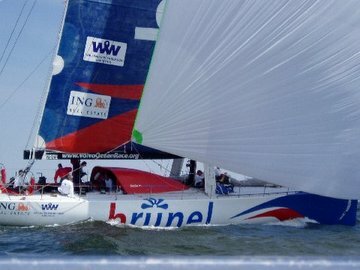 The race was controversial due to the failure by most competitors to finish the race and because of the suicide of one entrant; however, the race ultimately led to the founding of the BOC Challenge and Vendée Globe round-the-world races, both of which continue to be successful and popular. Way back in the early months of Zephyr (March 2005) I wrote a scathing post on windsurfing magnate Neil Pryde. The title - Sailor Neil Pryde’s swollen ego gobbles China, beats down the working man - was designed to elicit a response...and it did! 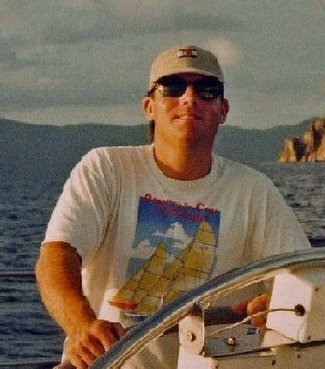 I just had a comment come in (defending Neil over a year later) from a reader who worked for Pryde running his Windsurfing North America division from 1992-96. Though I stand by an admittedly incendiary post, if anyone would know about Neil-as-a-person rather than Neil-as-a-capitalist...it's not me. So I have to take this recent leap to defend Neil at face value and, though I can't vouch for every sentiment expressed by an anonymous defender who, "...spent many weekends with Neil putting to practice both his and my work ethics," I'm also not going to take issue with the claim that, "...he was the best mentor a lower class kid could ask for." Maybe he was. Looking back to March '05, I'd also responded to "Jerry" - yet another defender of Neil Pryde - in a subsequent post that made some good counter points but failed to advance the discussion much (in my humble opinion). So I wonder aloud and invite comment, why does trashing Neil evoke such strong emotion? Could I have picked the wrong target for my anti-capitalist bluster? Or am I hitting too close to home? I last wrote about Dee Caffari some months ago on Valentines Day (see post: Valentine Wishes to Dee Caffari) - at that point she was on the verge of passing the halfway mark of her attempt to become the first woman to circumnavigate the world solo non-stop against the prevailing winds and currents. The tragic news from the Volvo has dominated sailing news...no suprise that last week it overshadowed the glory of Dee's accomplishment...but I think it's the right way to start anew this Monday despite the lingering sadness of Hans Horrevoets' death. 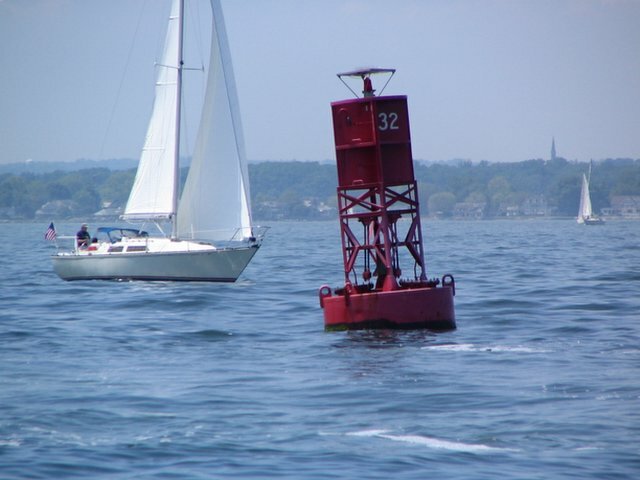 Last Thursday, May 18, the 33-year-old from Portsmouth, England completed a passage which ensures her a place in maritime history. After numerous setbacks, countless emotional and physical highs and lows...not to mention 29,100 ocean miles left astern, Dee's 178 day, 3 hour, 6 minute and 15 second journey ended off Lizard Point. 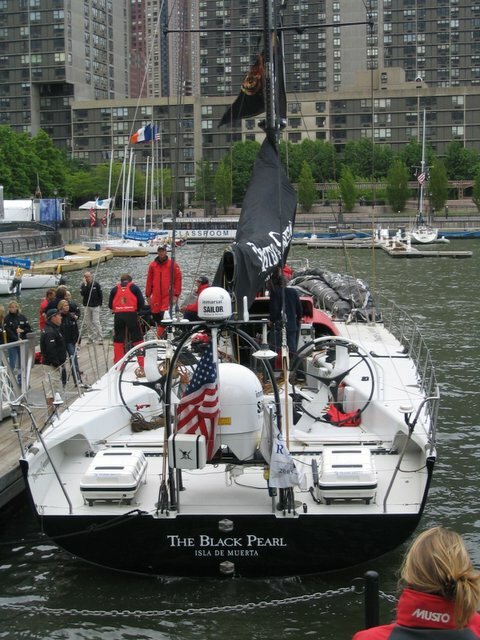 "It was a voyage of absolute extremes, and it pushed my limits further than I had imagined. There were times when I couldn’t see an end to it and I questioned whether I could do it. One of the hardest things was the mental challenge of dealing with it all on my own, but the support from my shore team and the outstanding performance of the yacht helped me bounce back when it got really tough. Now I’m physically and mentally exhausted but I don’t think I’ve ever been happier and I can’t wait to celebrate the achievement surrounded by family and friends!" If you've read Zephyr for any length of time then you'll notice I recently shifted the site to a new template. Along the side of the postings in the left margin there is room to pull in favorite nautical verse, quotes, etc. If you have any to suggest please point me to them. I'm specifically looking for any good bits from Joseph Conrad and Patrick O'Brian. The Volvo tragedy will be the last real post for the week. Have a good weekend...see you Monday. 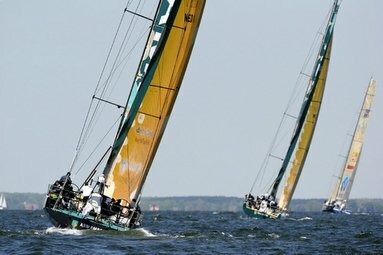 By now most have read about the sad news from the Volvo - Abn Amro Two lost a crewman - 32-year-old helmsman and sail trimmer Hans Horrevoets - overboard early Thursday. According to coverage the yacht was sailing downwind in 16-foot waves and 28-35-mph winds roughly 1,300 miles from Portsmouth, England in the Atlantic ocean. Crewmembers enacted a "man overboard" drill and recovered Hans but were unable to resuscitate him. Anyone who has been offshore understands this nightmare intimately...even if they've never pulled a dead mate from the ocean, or been the unfortunate person over the side. In the same way a mountain climber accepts the inherent danger of sudden blizzards or rock slides and backcountry skiers dread yet brave avalanches - offshore sailors live with the very real threat of going over. 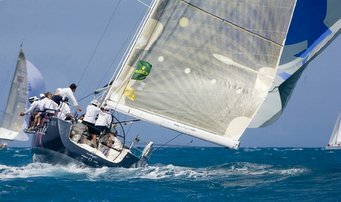 I came close years ago on the foredeck of the Maxi Yacht Javelin during a big blow in the Gulfstream. I was helping to reef the mainsail on the dawn watch and we shipped a big crossing wave over the deck from the windward side. It hit my chest, swept me off my feet and washed me to the leeward rail...being clipped to the jackline kept me on board. It was about a full minute or so before I could unclench my hands from the stanchion and steady myself...more than enough time to contemplate the dark, rushing water and the almost certain oblivion it promised. I'll never forget that feeling. God speed the crew of Abn Amro Two and God bless the soul of Hans Horrevoets. He died with his boots on. Article here in the Baltimore Sun that details the National Sailing Hall of Fame( and Museum)...which opened last Thursday at City Dock in Annapolis where it will remain until the end of the boat shows in October. I wrote on this a while back when the hall of fame/museum was funded - nice to see that it's finally open. I'll look forward to a visit this summer. From the Sun article, the 1,200-square-foot space is divided into three galleries. In the center of the first gallery is a new Optimist - a tiny single-sail boat favored among junior sailors on the East Coast. 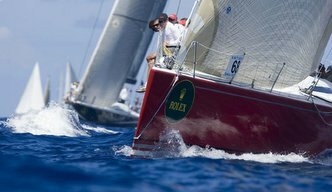 The sides of each gallery include images of boats under sail and photos of sailors who have been honored by the sport over the years, including those named the Rolex Yachtsman and Yachtswoman of the Year and those named to the America's Cup Hall of Fame and the Sailing World Hall of Fame. A reader commented the other day on a Captain Ron quote - saying that whomever wrote the movie script knew a lot about sailing from the "BN" perspective. He was right. I'm going to proceed with the assumption all of you know what a "BN" is, or at least what it stands for. If not, ask your closest boat bum friend. The term "BN" - despite its coarseness - delineates a very specific and useful class of sailor...those who, in somewhat blue collar fashion, work with and often live on sailboats. If you consider highly paid rockstars like Dennis Conner and Gary Jobson the tip of an iceberg, the supporting mass of "BN's" are the bulk that lies beneath the surface. Often unrecognized and certainly unsung, BN's earn their living as deck sanders and scrubbers, bottom painters, plumbers, electricians, mates, riggers, etc. Every offshore voyager has (luckily) a bit of the BN in them...but most weekend warriors on the beer can course do not (especially the wealthier ones). I'm proud to say that I was once a BN through and through and still carry the blood with me...despite breathing canned air and piloting a desk nine hours a day. A BN, above all, is authentic. Given that they must co-exist with society of hull thumping poseurs and Mount Gay cap-wearing sock jockey misfits...this authenticity is rare and estimable. I'm going to write more about the BN archetype - and what it embodies - in the near future...interested in your thoughts. Thanks Ward for the kind words. There is no better place on about.com as far as I'm concerned...I visit regularly. Your patience, please, as I tweak this new template. You may have to register for NYtimes.com but it's worth the read - great recap story on the Volvo finish in New York by journalist Chris Museler...detailing the short but punishing 400 mile leg. 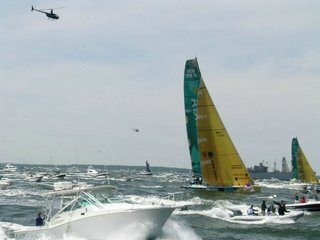 The short sprint from Baltimore to New York is keeping the Volvo Ocean Race crews on deck and lacking in sleep. With only 75 miles to go before reaching the Ambrose lighthouse, leading yacht ABN Amro One has had a tough time in the last 36 hours. They are currently 25 miles offshore, just north of Delaware heading towards Barnegat Bay, with wind speeds varying wildly from between 23 and 32 knots, but wind now dropping significantly in the last six hours indicating a slow crawl towards the bright lights of New York. It's now a dead beat up the coast. It was a bumpy first night last night, and skipper Mike Sanderson has not slept yet, such is his desire to wrack up maximum points for this leg. Sanderson reported gusts of over 40 knots and the crew shortened sail last night to a mainsail with three reefs and a number four jib. 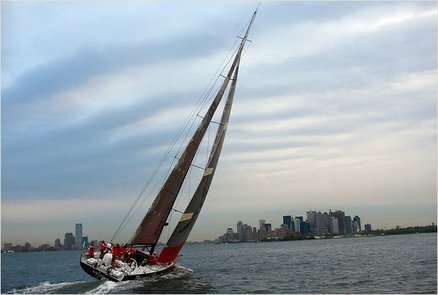 Monday night, with just 93 miles to go before crossing the finish line in the Hudson River, speeds are dropping as the wind goes light, giving the chasing Farr Yacht Design boats a chance to show their true colors. I was down in landlocked Atlanta this past weekend for a wedding but my folks, who are cruising on the Chesapeake on a 46' sloop, called me Sunday to say that they had witnessed the (re) start of the Volvo...which apparently kicked off with a stately procession of tall ships. They promised that they'll send photos when they dock. As well over the weekend I had a comment from Blue Barney responding to this post on a mystery cat boat photo I shot last Thanksgiving on the Tred Avon near Oxford...Barney says that it looks like a Hintenhoeller Nonsuch. He notes that, "...these wonderful boats were marketed by several companies in Maine." 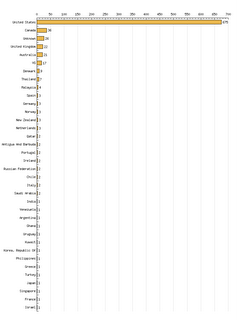 After doing a Google compare I'd have to say that it's a pretty good guess. Way to go Blue Barney! On page 29 of the May 2006 edition of SAIL Magazine you will find a brief written by Rebecca Waters titled "Captain's Blog" - appropriately placed in the "Sailing the Web" section. Rebecca has written a report on the state of blogging in the sailing world. In the piece she cites The Voyage of Windbird, NorthernMagic (loud music), the estimable Propercourse and the one and only Zephyr. She notes that interaction is the element that distinguishes weblogs from other forms of mass communication...and suggests that this interaction is missing from the sailing space. In a year plus of Zephyr I've recieved hundreds and hundreds of comments from all corners of the world (grateful for each one) but I have to agree...I expected more interaction from a community of storytellers (see post: Sailors are intrinsically storytellers - from a year ago this Friday). Kudos to Rebecca Waters (rebecca.waters@primedia.com) for writing what has to be the very first old media article on this new media channel. It's a significant step in the still novel world of those who write and read sailing blogs. 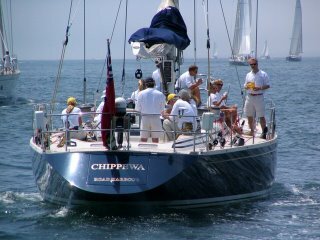 As I mentioned on Friday, the Chesapeake Bay Volvo "In Port" race took place over the weekend. I couldn't make it out to the course and so don't have a lot of first hand info to add... but a reader emailed me these photos (thanks NovelistEye) and you can read a summary of the event here on the Volvo site. Apparently Movistar, second place in overall rankings, was victorious under light air and brilliant sunshine - rounding the buoys in just under 2 hours 22 minutes.